If you’re like most folks, you use a variety of insurance products to manage risk and protect you, your family, and your assets from losses caused by property damage, businesses, property, accidents, disability, retirement, and death. However, instead of considering these insurances as separate items, we suggest you make them part of an integrated, overall risk management plan. Most insurance can be grouped in these general categories. Property and Casualty Insurances: This would include insurance on automobiles and other vehicles, home, furnishings, jewelry, and artwork – and personal liability insurance, including umbrella insurance. Business Insurances: Business owners need insurance on buildings they own, office equipment and computers as well as liability, worker’s compensation, errors and omissions, and business interruption insurances. Health and Disability Insurances: Disability income insurance replaces part of your income if you become ill or injured and unable to work. Health insurance helps to pay for medical services received and long-term care insurance helps to pay for extended care that is not covered by most health insurances or Medicare. Retirement Insurances: Annuities and other insurance products can help replace income after retirement. 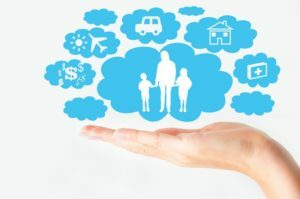 Estate Planning Insurances: Life insurance is often used to replace an earner’s income; pay funeral expenses, debts and taxes; fund family and charitable trusts; fund a business buyout and compensate the surviving owner’s family; provide an inheritance; and equalize inheritances for family members who do not work in a family business. Remember, insurance is for risk management — to protect you, your loved ones, and your assets from potential areas of loss. If a risk is no longer there (the exposure ends or you are able to self-insure and cover the risk yourself), then the insurance coverage for that risk can be eliminated. Trying to coordinate your own insurances and manage risks yourself is a daunting task. Instead, we suggest you work with a team of advisors who have the knowledge and experience to help you make sure your risks are covered at the appropriate levels, without duplication and unnecessary costs. An advisory team usually includes your financial investment advisor; estate planning attorney; life, health and property/casualty insurance agent(s); and a CPA. Other members may be added to your team as needed. You will probably find that your advisors will welcome the opportunity to work on your team, because they want to provide you and your family with the best possible service and solutions. We’re happy to connect you with the experts you need or work with the experts you already have in place.